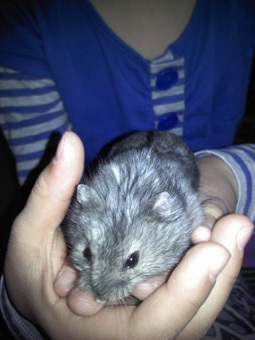 This past spring, my daughter Ariel who was in 2nd grade, asked if she can have a hamster because her much older brother owns one. I told her she can have one when she is in the 4th grade. She agreed knowing that owning a hamster was a great responsibility. One day we were shopping for craft material at a Michael's when we decided to pick up some hamster food for her brother's hamster at Petco. When we were about to make our purchase, we noticed a table set up in the front of the store with a sign "please adopt us". So my daughter and I decided to investigate. We saw a bunch of tiny hamsters hiding in a box inside a glass fish tank. The ladies, who volunteer for an animal sanctuary called Critter Camp, explained to us that they are rescued hamsters. They were all male and were about to be frozen before Critter Camp saved them all. My daughter looked at me and asked if she can have one. Without hesitation I agreed. I felt for those little guys. My daughter chose one with a white spot of fur on his dark coat. She named him Sneakers because of his white feet. Today Sneakers is called Mushy because he is so soft and lovable. He does not bite and will fall asleep in your hand while you pet him. I have to say I love the little guy, even though I am not a fan of rodents. By the way, my son decided to rescue one of his brothers, whose name is Sox because he has four little white socks.